* Bagged double, winning women singles and mixed doubles titles in the 3rd Nalini Kanta Mohanty Memorial State Open Badminton Tournament, organised by Amateur Badminton Club at Saheed Nagar Indoor Hall in Bhubaneswar from April 14 to 17, 2016. * Bagged a double by winning the women`s singles and mixed doubles titles in the 2nd Nalini Mohanty Memorial Open Badminton Tournament at Sahidnagar Indoor Hall in Bhubaneswar on January 11, 2015. * Bagged a double winning women’s and under-19 girls’ singles titles in the State Badminton Championship, held at Nalco Nagar in Angul from Sept 11 to 14, 2014. * Bagged a double by winning both the singles and doubles titles in the under-17 girls category of the State Age-Group Badminton Championship, held at NTPC, Kaniha (Angul) from July 31 to August 3, 2014. * Bagged a double by winning both the singles and doubles titles in U-15 girls` category of the State Sub-Junior Badminton Championship at Saheed Nagar Indoor Hall in Bhubaneswar on Oct 17, 2013. * Bagged a double by winning both the women`s and under-19 girls` singles titles in the State Badminton Championship at Ispat Indoor Stadium in Rourkela on Sept 28, 2013. 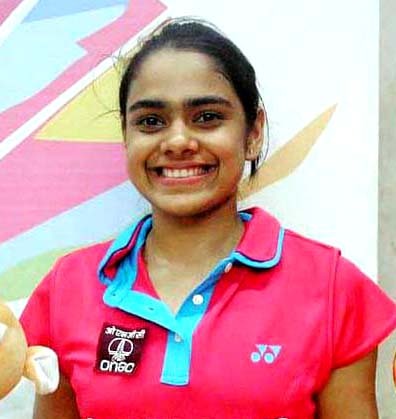 * Retained her double crown by winning the under-17 and under-19 girls`s singles titles in the State Badminton Championship at Saheed Nagar Indoor Hall in Bhubaneswar on August 16, 2012. * Won the junior girls` single title in the State Badminton Championship, held at J N Indoor Stadium in Cuttack from September 16 to 18, 2011. * Won the girls singles titles in three categories (u-13, 15 and 19) of the State Badminton Championship in 2011. * Won the women doubles title with Arathi Sara Sunil as partner in the All-India Senior Ranking Badminton Tournament at Bengaluru on June 18, 2018. * Bagged a double by winning both the women’s doubles and mixed doubles titles in the All India Senior Doubles Ranking Badminton Tournament, held at BBD Badminton Academy in Lucknow (UP) from March 15 to 18, 2018. * Reached semifinals in women’s doubles and quarterfinals in mixed doubles events of the 82nd Senior National Badminton Championship, held at Nagpur from Nov 4 to 8, 2017. * Reached second round (qualifying) in All India Ranking Tournament at Hyderabad, August 1-6, 2012. * Represented India in the 2nd Badminton Asia Mixed Team Championships, held in Hong Kong from 19-24 March, 2019. * Won her maiden international title by emerging women’s doubles champion with partner Arathi Sara Sunil in the Hellas Open-2018 at Chania in Greece on Oct 21, 2018. * Represented India in the 19th World Junior Badminton Championship, held at Yogyakarta in Indonesia from Oct 9 to 21, 2017. * In July, 2018, she obtained admission into KIIT University, Bhubaneswar to study Bachelor in Business Administration (BBA). * Former doubles international and current Indian team coach Arun Vishnu was the one to spot Rutaparna playing 2016 Patna National Championship with younger sister Swetaparna and convinced chief national coach Pullela Gopichand to call her in for a trial of sorts at their Hyderabad academy. * Made her international debut in the Asian U-19 championship where Trupti Murgunde was the Indian coach. * Started playing badminton in the year 2009. * Travelled between Cuttack and Bhubaneswar, almost daily with her father to take coaching from Manoj Sabat.